We are delighted to be now able to offer clients referral to our Veterinary Ophthalmologist Mr Brian Patterson BVM&S Cert VOphthal MRCVS. Brian will be holding regular weekly clinics at our Kidderminster surgery. For clients who wish to discuss having their animal seen by our ophthalmologist please contact your veterinary surgeon at your own practice to arrange a referral. We will need a full clinical history and referral letter from your own vet to be able to arrange the appointment. CLIENTS wishing to arrange an appointment with Brian please discuss with your own veterinary surgeon to arrange a referral appointment. Appointments cannot be made without a formal referral from your own veterinary surgeon. This is because we need your animal’s clinical history and to report back to and liaise with your vet about further treatment options. BIOGRAPHY: Mr Brian Patterson BVM&S Cert VOphthal MRCVS. Brian was awarded the RCVS Certificate in Ophthalmology in 2002 while a resident at the Weipers Centre, University of Glasgow. 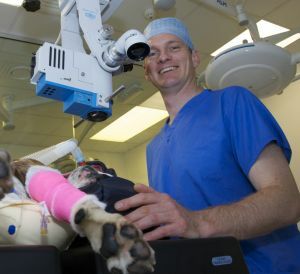 As a full time veterinary ophthalmologist, Brian has been involved in teaching at the University of Bristol (2010-2012) and has lectured both nationally and internationally. In house, multidisciplinary support for ophthalmic disease of systemic origin.